I’ve made it no secret that my favorite news station (actually, “favorite” might not be the right word. How about “leasted hated”?) is MSNBC. So, likely, it’s no surprise that I find myself on MSNBC.com quite a lot. 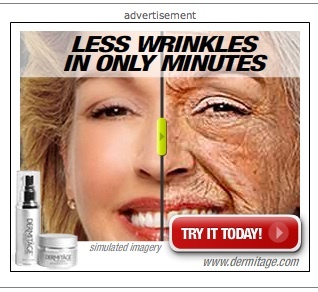 There’s been an ad circulating for some sort of mystery facial cream called “Dermitage,” and I’m wondering how advertising like this is legal. Welcome to the miracle cream that fills craters the size of the Grand Canyon and takes 40 years off of your face. My absolute favorite part is how the application of this cream changes the color of your hair from “old person” gray to “hot blonde.” Truly amazing. Now, I understand that it’s “simulated imagery,” as it says in pretty small letters, but as someone who makes and places online advertisements, I begin to wonder…how is that not false advertising? And how is that, in any way, allowed? Is there any oversight on this? Is this stuff regulated? I highly doubt that this “Dermitage” company cares about its integrity and its reputation (it’s pretty clear that when you advertise like this, you likely don’t), but shouldn’t MSNBC, as a place that should care about news and facts, have a better “false advertising” policy? ~ by Brad Levinson on April 1, 2008. I thought I was going crazy when I saw those ads for the first time. I am glad you point this out. I believe they recently made and update on the after effect imagery, yea before it was believable but now is worse. Sadly there most is thousands of users falling for this deceitful ad.